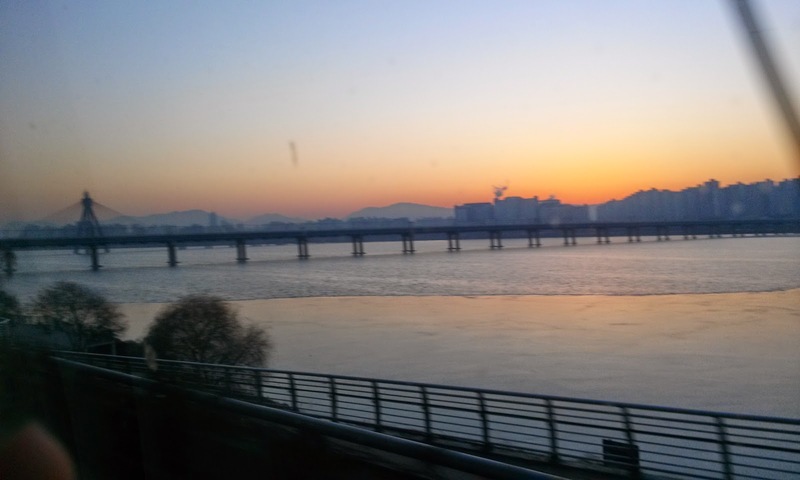 After three weeks of traveling, I finally made it back to Korea around 5 AM. I know I've said it before, but I truly never realize how much Korea feels like home until I return after being away for a bit. After weeks of relying on maps and random wireless connections to get me from place to place, I finally knew where I was going again. The cold air was a bit of a shock to the system, but I was happy to be home and I was lucky enough to have an absolutely beautiful sunrise to greet me. 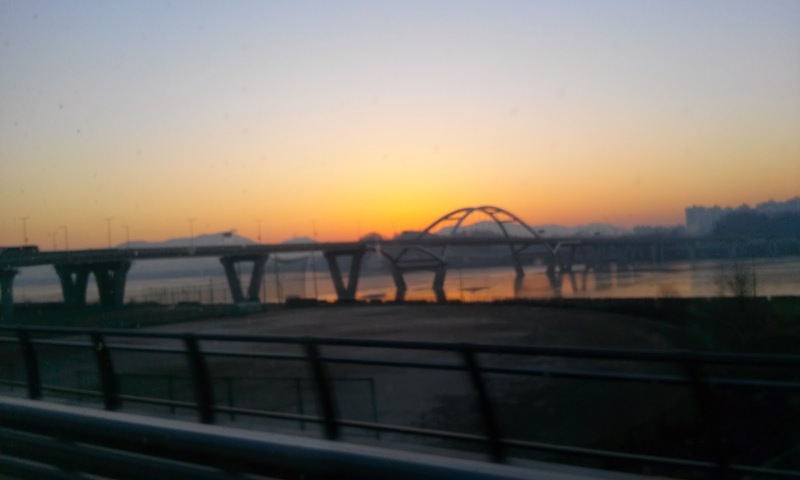 When I came back to Korea it was Sunday and I returned to work the next morning. It was a whirlwind, and it's only been with more time that I've been able to gain some more perspective on my time traveling. I had so many experiences over this trip, but in general, here are some of the main takeaways from my time traveling to Laos, Cambodia, and Hong Kong. 1) Solo traveling isn't really scary at all. This was my first time traveling by myself. The decision to travel solo wasn't really one I was necessarily excited about at first, but it was in reality just made out of necessity. I spend a lot of my time these days reading travel blogs or travel articles and they all at some point or another talk about the benefits of solo traveling. According to people who have done it, it's a great experience and a unique way to travel, so in the back of my mind I always knew I wanted to give it a shot at some point. However, I thought it would be something I did during a short trip--say maybe during a five day break. I definitely never thought my first solo trip would be three weeks long. When it came time to plan my winter vacation I knew just where I wanted to go. Since this was the last long break I had while I was in Asia, I knew I had to go to the "big" places like the temples of Angkor while I had the chance. However, most of my friends in Korea have been here much longer than I have and have already checked these things off of their lists. Add in the different dates everyone gets for vacation, and I knew if I really wanted to go to these places I had to go by myself or else I was going to miss it. Finally, one day after a particularly aggravating day at school and tedious teacher's dinner, I came home and decided to bite the bullet and book my tickets to Laos. Before I left I read just about everything about solo traveling, researched just about every step of the trip, bought travel insurance, and decided to put my faith in God for everything else. When I arrived in Laos I was reassured that everything would be OK due to the fact that 1) there were TONS of solo travelers in the hostels and 2) even for a pretty reserved person like myself, it was immediately super easy to meet other people. The wonderful thing about traveling solo is that you can do exactly what you want to do--you don't have to do anything you don't want to or miss something that you want to see. Traveling with a friend removes so much of the pressure and anxiety that comes with traveling, but there are also problems that can come along with it--you can get incredibly sick of the person, you sometimes want to do different things, and since you're together you sometimes don't spend the time to talk to the other travelers all around you. When you're by yourself you can do exactly what you want to do, and you meet far more people from around the world. If I hadn't been by myself I never would have spent my days in Laos with a girl from Germany, had dinner with two guys from the Netherlands, visited the temples of Angkor with a guy from Denmark, explored the countryside of Cambodia with girls from California and Canada, had dinner in a Burmese restaurant in Phnom Penh with two girls from Germany on my last night in Cambodia, or met many of my other roommates along the way from Australia, China, France, Canada, and Brazil. I may never see many of these people again, but that's not the point. The point is that because I did meet them I had some sort of unique experience and learned not only about the countries I was visiting at the time, but also about the lives of these people, their countries, and their experiences traveling. When I got back to Korea, I couldn't help but think wow, I really did it. I often say that the hardest part of coming to Korea was just being brave enough to come here in the first place. Everything else since then has been easy in comparison to just making the decision to get on the plane and come. I feel solo traveling is pretty much the same--the thought of doing it is a lot scarier than actually doing it. Now that I know I can do it, I know I don't need to sit around and wait for someone else to come travel with me--I am fully capable of doing the things I want to do by myself. 2) Materialism (I have a lot of stuff!) 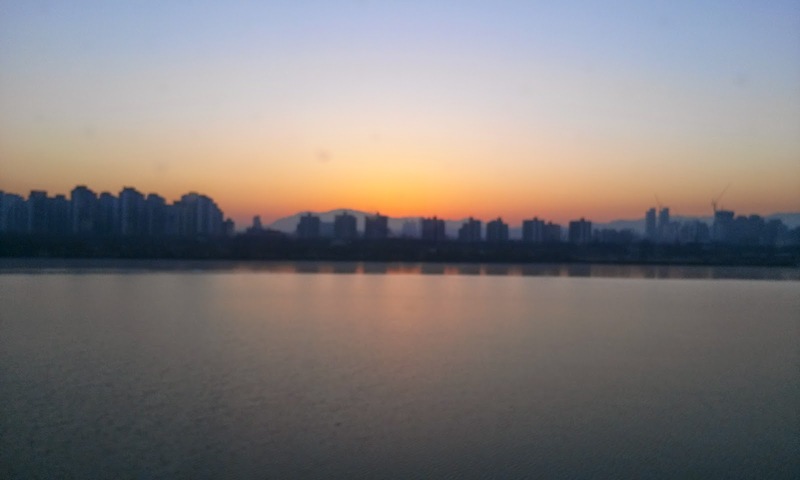 -- I finally got back to my place in Jeomchon around 9:30 AM, at which point I entered my apartment for the first time in three weeks. When I walked inside my apartment felt SO BIG and immediately I felt like I had a crazy amount of stuff. I guess after staying in hostels and living out of my backpack I forgot just how much stuff I actually own. This feeling was also probably impacted by the fact that I had spent time in countries where so many people have so little. Cambodia especially left an impression on me due to the fact that no matter where you go around Siem Reap and Phnom Penh, there are kids running up to you asking you to buy things from them. It's not just the kids either--it's the beggers who are missing limbs from landmines (which are still a big problem to this day despite the fact that wars have been over for decades), the children who walk such long distances to school, the kids you see running around without shoes or clothes, the small and broken down houses, and the stories of people who work from morning until night just to survive. The culmination of these things really impacted the way I see all of my "stuff." Since this trip I've continued to think about the stuff I own, the things I spend my money on, and being more charitable. 3) The difference between living abroad and traveling. I'm pretty sure I mentioned this after traveling to Thailand last year, but this is something that just hit me even more this time around now that I've been living in Korea for a year and a half versus the six months I was at when I went to Thailand. When you travel in SE Asia you're essentially in backpacking territory. Backpackers are EVERYWHERE and tourism is a huge industry in many of the SE Asian countries. Obviously there is a huge amount you can learn by traveling to these places, but what I've realized more than anything else is that by spending a short amount of time in a country you really only hit the surface. Don't get me wrong, you can still learn a lot from the surface. You see new and interesting things, which without doubt provokes a great deal of thought or incites a new interest or passion. You of course also learn basic things about culture and history and you eat lots of new foods that you've never had before. You see and meet so many people who have been sharing this planet with you this whole time, yet you never knew existed. These are amazing things, but living abroad is a totally different experience. When you live in another country it becomes your home. You learn deeper things about the culture and history. You learn how to do everyday tasks like banking and grocery shopping. You build friendships with the locals that last more than a few days or weeks. You learn all the modes of transportation and eventually you rarely need to ask for help anymore. I found it interesting that so many people go to SE Asia to experience new cultures, but in reality so many of these places are now catered towards tourists. There are so many people who speak English and there are tons of western options for foods. Although most people would never think of coming to Korea, I can easily say that I experience more Asian culture in Korea, where few people speak English, I get stared at as I walk down the street, and western food is pretty much limited to the major cities, than I did in SE Asia. Of course, as I said there are so many reasons to travel to these places, even if they cater towards tourists because you can still learn so much from visiting them. However, after living in Korea I can really say that I'll never feel like I really know a country until I've lived there, and even then it takes some time to see the depths of a country. During my trip I often wondered what I would learn about these places if I had more time to spend there or lived there for a bit--I was super aware of how much I still didn't know. I'm not sure I would even think to wonder this if I didn't know how much I've learned by living in Korea. This is the last post I'm going to write about my time traveling in January. It certainly took me some time to catch up, but thanks to everyone who read along. I still have an entire trip to China to catch up on, but luckily that one will be much shorter because I was only there for a few days! I'm immensely thankful for the opportunities I've had to travel, and even more thankful for the opportunity I've had to live in Korea for this year and a half. Sometimes I still can't believe life has brought me here, but I'm certainly glad that it has.